Scientists at the National Ignition Facility at Lawrence Livermore National Laboratory plan to model the center of a planet or star using laser-driven inertia confinement fusion techniques. 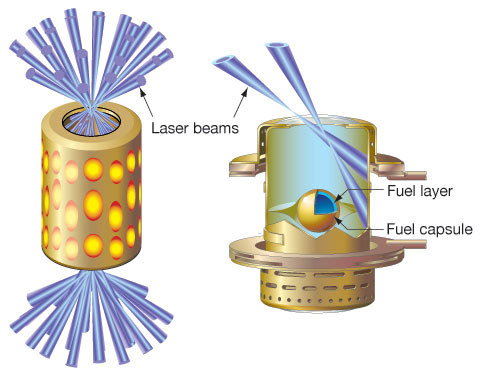 These techniques use convergent beams of laser light to ignite small fusion explosions. The new setup at Livermore will produce pressures up to 100 billion atmospheres and temperatures of 100 million degrees. These conditions are similar to those in the center of planets and stars and also approximate conditions when nuclear weapons are detonated. 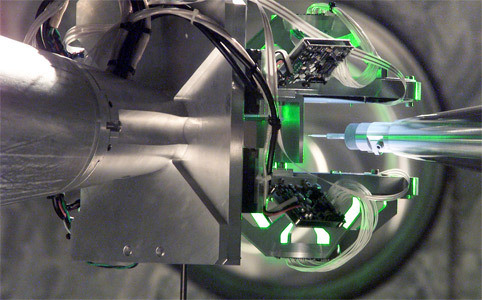 Experiments at the National Ignition Facility could lead to enhanced understanding of astrophysics, hydrodynamics, plasma physics, and other sciences, as well as play a key role in stockpile stewardship (the assessment and certification of reliability and safety of nuclear weapons). The facility may also lead to additional insight into the Big Bang Theory; this is by far the closest approximation to conditions at the start of the universe ever produced in a laboratory setting, orders of magnitude closer than any other setup in existence. The National Ignition Facility is still being built; experiments are scheduled to begin in 2010. The facility will incorporate 192 lasers, focusing on a gold cavity with a small pellet containing micrograms of the hydrogen isotopes deuterium and tritium inside. This creates a plasma radiating x-ray that heats the outside of the pellet and blows off the outer layer. This causes the rest of the pellet to implode, which causes the fuel inside to compress and heat further, resulting in a self-sustaining burn called ignition. This will be the only facility in the world that produces more energy from the implosion than it uses to run the lasers powering it. This approach to fusion reactions may eventually lead to viable fusion plants generating commercial power. However, any such applications are still in the distant future. Currently, the focus is on the scientific experiments and stockpile stewardship programs. Particular areas of interest include examining the lifecycle of stars and stellar evolution, expanding our knowledge of black holes, and exploring the instabilities in supernovae (some of which may be reproduced in the plasmas within the National Ignition Facility). TFOT has reported on several new scientific research facilities including the Large Hadron Collider at CERN and its subsequent temporary shutdown, NASA’s Gamma-Ray Large Area Telescope (now called the Fermi Gamma-Ray Space Telescope), and the Los Alamos Magnet Lab (home to some of the world’s largest magnets). TFOT has also reported on a variety of research into black holes including new high resolution images of the black hole at the center of the Milky Way galaxy, a recent study that suggests the mass of a black hole is limited, and proof that the black holes at the center of many galaxies eject sprays of particles at nearly the speed of light. More information on the National Ignition Facility and its physical setup can be found here. You can learn more about inertia fusion energy and the process used to achieve ignition here. More information about the National Ignition Facility’s role in Stockpile Stewardship can be found here and more about the scientific research planned by the facility here. You can also follow the project status during its ramp up here.